ANGLE is a world leading liquid biopsy company with sample to answer solutions. ANGLE’s proven patent protected platforms include an epitope-independent circulating tumor cell (CTC) harvesting technology and a downstream analysis system for cost effective, highly multiplexed analysis of nucleic acids and proteins. 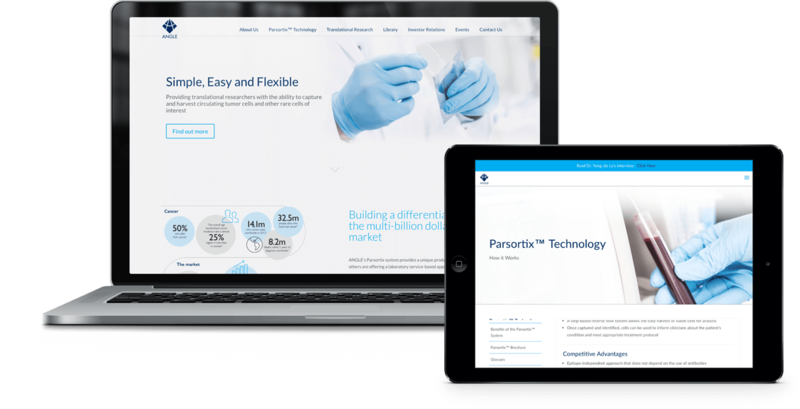 The previous ANGLE plc website was outdated and needed a refresh to reflect their global position in the liquid biopsy market place. SoBold worked with ANGLE plc to establish all of their requirements before initially designing the website. This site was then developed by SoBold’s development team over the course of a period of 3 months. Integrations, such as the running an Investis script on the homepage of their website allow the ANGLE plc website to reflect their share price and ensures the website is updated automatically inline with the live share price. SoBold now manage the website and all of its updates on behalf of ANGLE plc.